Crestware CW20 Crest Wood Bowl 20"
TigerChef > Dinnerware > Wooden Dinnerware >< Wooden Salad Bowls > Crestware CW20 Crest Wood Bowl 20"
✔ 4-ply thickness✔ Professional grade✔ Dimensions: 20"
$5.10 Winco WWB-20 Woven Wood Salad Bowl 20"
$8.29 Royal ROY WWB 20 Woven Wood Salad Bowl 20"
$1.09 Crestware CW08 Crest Wood Bowl 8"
$0.69 Crestware CW06 Crest Wood Bowl 6"
$2.89 Crestware CW14 Crest Wood Bowl 14"
$4.69 Crestware CW16 Crest Wood Bowl 16"
$2.19 Crestware CW12 Crest Wood Bowl 12"
$5.19 Crestware CW18 Crest Wood Bowl 18"
$1.69 Crestware CW10 Crest Salad Bowl 10"
$1.52 Winco WWB-12 Woven Wood Salad Bowl 12"
$4.12 Winco WWB-18 Woven Wood Salad Bowl 18"
$2.18 Winco WWB-14 Woven Wood Salad Bowl 14"
$0.72 Winco WWB-8 Woven Wood Salad Bowl 8"
An excellent addition to restaurants, catering companies and other food service facilities, the Crestware CW20 Crest Wood Bowl 20" features a stylish look that will complement a variety of settings. 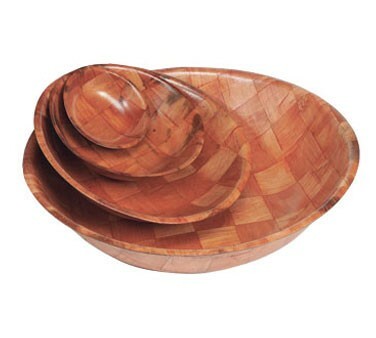 This bowl is constructed from woven wood which adds a natural touch to your food presentation. Perfect for serving fruit, salad and more, this bowl's aesthetic appeal will draw attention to your served food. Thanks to its 4-ply thickness and professional grade design, this wood bowl is durable enough to serve your business for years.